New Super Mario Bros. U Deluxe (still a mouthful of a title!) is the latest in a line of Wii U games given a second chance at life on the Nintendo Switch, following the likes of Captain Toad: Treasure Tracker, Bayonetta 2, Hyrule Warriors: Definitive Edition, Donkey Kong Country: Tropical Freeze, and, of course, Mario Kart 8 Deluxe. It plays the same — almost exactly the same — and comes with few changes when compared to its original version. That considered, I want this review to be about New Super Mario Bros. U Deluxe’s merits as a game — not a port. I’ll still discuss the changes and its value as a “deluxe” version, but these elements won’t factor into my score. There are plenty who never owned the original version, and I’d like this review to be for them while still appealing to returning gamers wondering if this is worth a double-dip. I’ll start off by saying I don’t really consider this title worthy of the “deluxe” moniker. When I purchased my Wii U several years ago, it came bundled with a disc copy of New Super Mario Bros. U that also included New Super Luigi U, so the only thing really new in the Switch version of the game for me was Toadette/Peachette. New Super Mario Bros. U Deluxe takes a bundle that already existed on Wii U, slaps in a new character and power-up, calls itself “Deluxe,” and calls it a day. That’s about it. That, of course, doesn’t mean New Super Mario Bros. U Deluxe isn’t a fantastic game, because it is, and it was when it first launched almost seven years ago, too. Let’s dive into what makes this game so great — and where it comes up short. The story of New Super Mario Bros. U Deluxe is a tale as old as time… or at least the ’80s: Bowser and the Koopalings’ve kidnapped Peach, and it’s up to Mario (and friends) to save her. He along with Luigi and Toad travel across the Mushroom Kingdom, conquering levels and enemies on their way to rescue the princess. 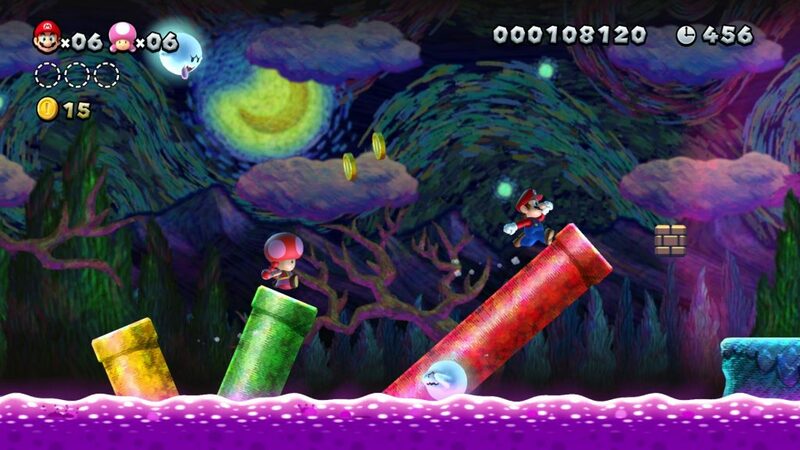 In this edition of New Super Mario Bros. U, Nabbit and Toadette join the adventure, the latter of which was previously a playable character exclusive to New Super Luigi U. New Super Mario Bros. U Deluxe is a side-scrolling platformer that plays not unlike New Super Mario Bros. games of the past. Characters duck, dodge, spin, fly, and swim through eight different worlds in the main campaign, plus eight remixed ones in New Super Luigi U. In the middle of each world, players will fight a mini-boss, followed by one of the Koopalings at the end of the world. 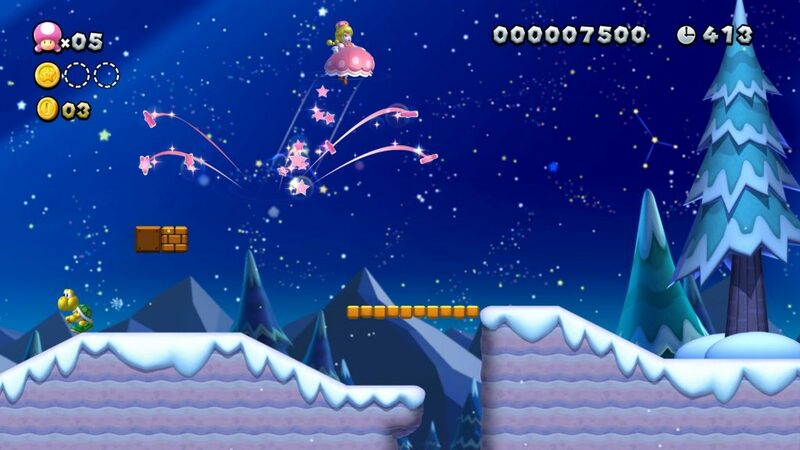 Levels are filled with various power-ups: returning ones like the Fire Flower, Ice Flower, and Propeller Suit, plus the new Super Acorn, which allows Mario and friends to transform into Flying Squirrel forms and glide and grab walls. There’re also cute critters you can use to your advantage, like Yoshi and Baby Yoshi, the latter of which can blow up like a balloon and allow players to float around stages. Plus, it devours everything it comes into contact with, ingesting Koopa Troopas and other baddies whole. 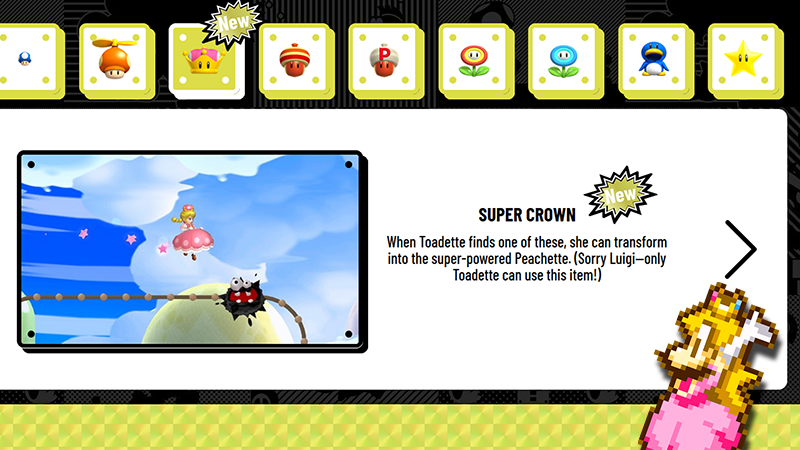 The Super Crown, an item not seen in the original Wii U game, exclusively gives Toadette the ability to transform into “Peachette,” an unholy hellspawn cross between herself and Princess Peach. With the very essence of the Mushroom Kingdom’s royalty running through her blood, Toadette as Peachette can float in the air, double jump, and survive pit falls one at a time, helping alleviate the pain of some of the game’s tougher levels. And tough they can be, especially if you’re aiming to collect all three coins scattered among each level. I’m not excellent at platforming games, so I’ll admit I had some difficulty with some of the game’s later stages — both on the Wii U and the Switch. Fortunately for those like me, the game comes with an even easier option than Toadette in the form of Nabbit: a strange, purple rabbit wearing, seemingly, Bowser Jr.’s snot-drenched handkerchief. Nabbit is invincible to all enemies, but cannot pick up any power-ups. If you really wanna speed through this game, grab a friend and play with these newcomers. While New Super Mario Bros. U Deluxe is a blast to play on your own, where the game really shines is its co-op play. I beat the original Wii U game with four of my friends (the fourth using the GamePad to draw supporting platforms for us — a feature not present in “Deluxe”), which was a chaotic romp full of swearing and laughter. I’ve been able to continue enjoying that level of fun with the Switch version, wall-jumping, block-crushing, and Goomba-stomping with the help of my boyfriend. And while he isn’t much of a gamer himself, New Super Mario Bros. U Deluxe employs just the type of casual, laidback gameplay we can both enjoy together. There is one downfall to playing co-op, however, that wasn’t around for the original Wii U game. In the OG version, players had the option to play as Mario, Luigi, Blue Toad, and Yellow Toad, all of which had comparable abilities and play styles. In “Deluxe,” however, your options are now Mario, Luigi, Yellow Toad (and Blue Toad, although you have to pick one or the other), Toadette, and Nabbit. What’s wrong with that, you wonder? Well, Toadette and Nabbit both come with natural handicaps: Toadette has game-breaking abilities as Peachette, while Nabbit is invincible to all malevolence. In New Super Mario Bros. U Deluxe, there’s no way to play four-player co-op with all players enjoying the same playing field: one player will always have an advantage over another. This problem’s even more pronounced in New Super Luigi U, where players’ only options are Luigi, Yellow/Blue Toad, Toadette, and Nabbit. Mario’s nowhere to be seen. This isn’t a deal-breaker, but it is an odd design choice. I’m curious if this was an intentional decision made by developers, or simply something overlooked. If it’s the latter, I can only hope Blue Toad is patched in as a playable character selectable even with Yellow Toad present. Ultimately, if you like 2D Mario gameplay, and especially New Super Mario Bros. gameplay, you’re going to love New Super Mario Bros. U Deluxe. It’s filled with all the best ideas of past games and a handful of new ones, all wrapped up in a 1080p, high-def package. Plus, with the portability of the Nintendo Switch, you can take it with you wherever you want — an often-overlooked feature when compared to its Wii U predecessor. Speaking of its 1080p-ness, New Super Mario Bros. U Deluxe looks pretty good– for what it is. I mean, it’s no Super Mario Odyssey — it’s the same kind of empty, soulless art style as past New Super Mario Bros. games, but it’s passable. Let’s be real: New Super Mario Bros. U Deluxe looks dated. I didn’t expect a complete revamp of the art style with this so-called “Deluxe” edition, but even the original game looked dated and, frankly, very uninspired. Beat level after level after level and you’ll start to see the same backgrounds and the same assets over and over again. You’ll see those same desert ruins. Those same trees and clouds and those same weird… sideways mountains that kinda look like crystals? You get it. It’s repetitive. It’s uninteresting. And for the next New Super Mario Bros. game, I’d like to see some more captivating locales and environments. Think “Odyssey” levels of creativity. I want to see them do away with that fake, plasticky sheen that everything in the Mushroom Kingdom seems to have. 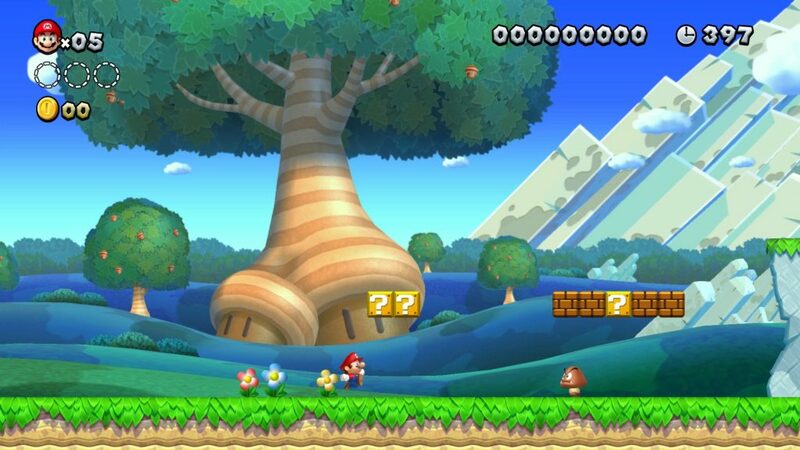 I love the gameplay of New Super Mario Bros., and I’d love for it to look as great as it plays. The game’s music also leaves much to be desired. “Deluxe’s” collection of tracks is full of uplifting, spirited tunes, but like the game’s art style, there’s definitely something lacking when compared to other Nintendo titles like Donkey Kong Country: Tropical Freeze or even Super Mario Odyssey. Some may argue the 2D Mario series has always lent itself to basic, boppy sounds, but there’s no reason that can’t change. There’re only so many times I can handle hearing “BAH BAH BAH!” blasting in my ear before I go insane. There’s also good to be had in New Super Mario Bros. U Deluxe’s presentation, though: Everything is bright and colorful, and some level designs are outright gorgeous (looking at you, World 5-4). I can live with the current state of the New Super Mario Bros. series’ style, but it’d be a shame if it didn’t evolve with its next installment. New Super Mario Bros. U Deluxe is just an all-around good time — especially if you have others to enjoy it with. It’s a lighthearted, relaxing caper through the Mushroom Kingdom, and if that’s what you’re looking for, you cannot go wrong with “Deluxe’s” lively charm and gameplay. 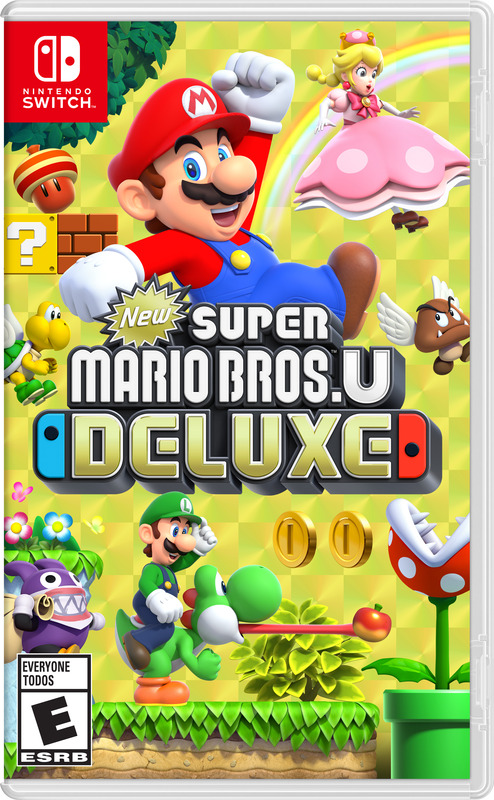 It’s not really a “Deluxe” title by any means: It’s the same New Super Mario Bros. U/New Super Luigi U bundle that existed on Wii U, just with a couple new playable characters and the Super Crown. Oh, and some small UI refreshes. If you owned the original game and New Super Luigi U, there isn’t really anything new here for you to enjoy — unless you really liked this game. If you played the original but missed out on the harder New Super Luigi U levels, this is worth picking up for that extra challenge (which you can start before the main campaign, by the way). And, of course, if you’ve never played either New Super Mario Bros. U or New Super Luigi U, I’d absolutely recommend giving this game a try. It’s an outright blast, both alone and with friends. Let’s just cross our fingers that Luigi is given the chance to enjoy the Super Crown for himself in New Super Mario Bros. U Deluxe’s inevitable successor. Poor guy just wants to rock some pigtails.